There are several reasons why rural electric cooperatives are in a good position to bring modern-day connectivity to their unserved members, the report notes. Perhaps the most important advantage is that many co-ops are already investing in broadband networks to support smart grid technologies, such as advanced metering infrastructure (“smart meters”). 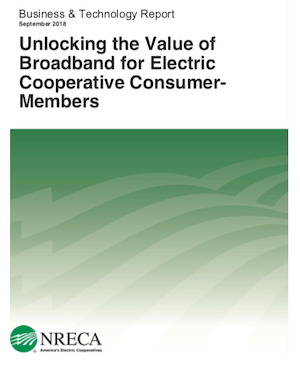 The report points out that a broadband backbone ”not only enables the co-op’s smart grid operations, it also enables connectivity to the broader Internet backbone.” By expanding off their existing broadband networks, electric cooperatives could deliver affordable, reliable, high-speed Internet access to their rural members.